In a perfect world, your text message marketing list would grow at rapid rate. Your subscribers would be utterly obsessed with your text campaigns, and rightfully so. You’d regularly fire out high value promotions that made offer redemption seem like an obvious next step. This might be ideal, but isn’t always what ends up happening. But sometimes, it’s totally ok to daydream. Let’s sit back for a minute, and envision the perfect text marketing subscriber. Now, as a Slick Text customer, these are some great behaviors to shoot for. Consider this post a list of text marketing subscriber #goals. 1. 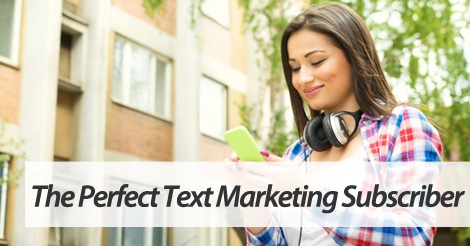 The perfect text marketing subscriber opens your text in the first five seconds. Sure, we all know 99% of all text messages are opened within five minutes or less. But, did you know that 95% of all text messages are opened within the first five seconds? That’s insane. The perfect text marketing subscriber totally falls in line with this statistic. 2. The perfect text marketing subscriber tells friends about your amazing deals. Did you know that 22% of all text marketing offers are forwarded to family and friends? In a perfect world, your text message marketing subscriber would chat nonstop about your amazing offers. This in turn would help grow your list. 3. The perfect text marketing subscriber claims your offer within the allotted redemption window. We’re all about using an expiration date to encourage a sense of redemption urgency. The ideal text marketing subscriber will read your offer, and immediately redeem. In this situation, everyone wins. The subscriber gets to cash in on an amazing deal, and you get to reap the benefits of increased business. Partner up with top text message marketing provider, SlickText.com. Give us a buzz at 1.800.688.6290 to learn more, or head over to the pricing page and sign up for a free plan. Our educational tools are second to none, and they provide every single user with the information needed to succeed.